Home has many different definitions, both physical and conceptual. It is where the heart is, according to Pliny the Elder, or it’s where you keep your stuff according to George Carlin. It’s a structure, a family, a memory, or just anywhere you feel comfortable. Or maybe it’s all of these things. I spend a fair amount of time on the road, traveling for work or for pleasure. While my true ‘home’ is certainly Denver and my house and my wife, I fall into the camp that believes that ‘home’ can exist in other places as well. If my stuff is there and I’m sleeping there, it’s home, even if it’s just for a night. I started thinking about where these temporary homes have been, and decided to do an analysis of it, because, you know, that’s who we are here at Corona Insights. Like most data analyses, the question becomes more complicated once you start measuring. The first issue is scale. What am I measuring? Is it as specific as a hotel room? The hotel itself? The city? The state? If I measure actual hotel rooms, the data is so detailed that it’s not particularly useful. And if I measure it on a state level, then I omit a lot of overnight trips in Colorado where my ‘home’ for the evening was not in Denver. I needed to define my research goal to answer this question. The second issue is how I classify data. It seems like measuring where one spends the night is easy, but is it? I’ve spent some nights on long-distance flights, so is ‘home’ the destination, the origin, or the plane itself? The same question arises on overnight train trips. Was my ‘home’ in the state where I went to bed or the state where I woke up or the state where I spent the most sleeping hours? And ships make things even more complicated. I’ve slept on ships in international waters, ferry boats plying coastal waterways, and cruise ships docked in port. What are the rules? The third issue is developing and verifying a data source. In this case, I frankly relied on a very healthy memory for trivial facts and a couple of calls to my parents. Sure, I could dig out 50+ years of receipts, but in this case my research goal was to develop a good overview. I could be quite accurate just based off memory and a very structured system for testing that memory, even if perhaps my precision isn’t perfect. Do I remember if I spent 8 nights in Madagascar or 10? No, not really. But that’s not necessary to achieve my big-picture goals. I decided that my research goal was to measure where my nightly ‘home’ was, rather than the nights spent away from my primary home. This is in keeping with my philosophy that home is where I’m sleeping that night. 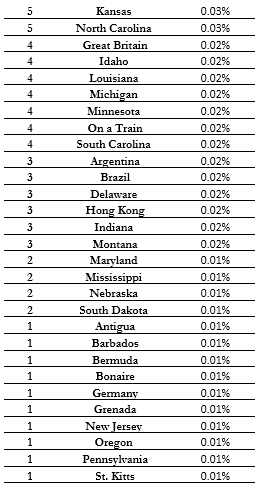 I decided to measure based on state for domestic travel and nation for international travel. This was a bow toward creating easy to digest data and keeping the data presentation manageable. I decided that sleeping on a moving vehicle that crossed multiple states or nations would mean that ‘home’ was the vehicle. Sleeping in a stopped vehicle would count toward the land that was underneath the vehicle, and sleeping in a moving vehicle that did not cross multiple states or nations would count toward the land beneath the vehicle. In the case of ships, the above rule would generally apply, but with some specific additional interpretations. “International Waters” would be equivalent to a state or nation, and if the ship did not enter another jurisdiction that night then my ‘home’ was International Waters. However, if the ship crossed international waters between an origin and destination in the same state or nation, then my home was that state or nation. For example, an overnight ferry in 1997 that crossed the Tasman Sea from Tasmania to Melbourne counts as Australia in the data, while bouncing from island to island in the Aleutians aboard the Alaska Marine Highway System counts as Alaska even if the ship occasionally ventured into international waters en route. In the case of air travel across multiple time zones, I would merely count a 24-hour cycle from the time of takeoff. Otherwise the data get skewed by long east-west trips given time changes. So in summary, it seems really straightforward to measure where you spent the night, but you still have to define rules to deal with ambiguity. If spending that night requires a half-dozen rules, one realizes the extent to which we have to define rules in our more complex demographic analyses. After defining the rules, the data collection began. It primarily involved developing a list of states and nations and then asking myself, “when have I ever been there”? I also asked my parents a few odd questions, such as, “Remember that time we drove cross-country to Disneyland in 1966? Did we spend the night in Utah or Nevada along the way”? The process went relatively smoothly overall, and I present to you below a compendium of every state, nation, and moving vehicle where I’ve ever spent the night (including leap years). And to make it easier on the eyes, here’s a map, courtesy of Matt Bruce. So what did I learn from this? Aside from recognizing that I like to analyze things a little too much, I learned several things, with the following highlights. Missouri had more than a 50 percent market share until approximately November 26th of 2013. It now stands at 48.0% and no state has a 50% market share. I’ve lived in Colorado for over 22 years, but am still trailing Missouri. At my current rate of travel, Colorado should move into the #1 ranking on approximately September 30th of the year 2020. I’ve spend 1.5% of my life sleeping in foreign countries. That’s a lot more than I would have expected. Six of my top 20 temporary homes are foreign countries and two are transit homes (ships and planes), but that’s understandable. Vacations overseas tend to be longer, so I spent more time there once I arrived. California will very likely move into the #6 spot in 2017, if not 2016. I really need to get to New England. And that conclusion about liking to analyze things too much?